Martha Berry thanks Mrs. Higginson for her gift to the school and explains some of the ways in which it might be put to use. She explains that the school is growing and that the rising demands could not be met without donations from friends. She ends the letter by telling Mrs. Higginson what the students are learning and suggesting that if she saw the work being done, she would feel that her gift was worth it. 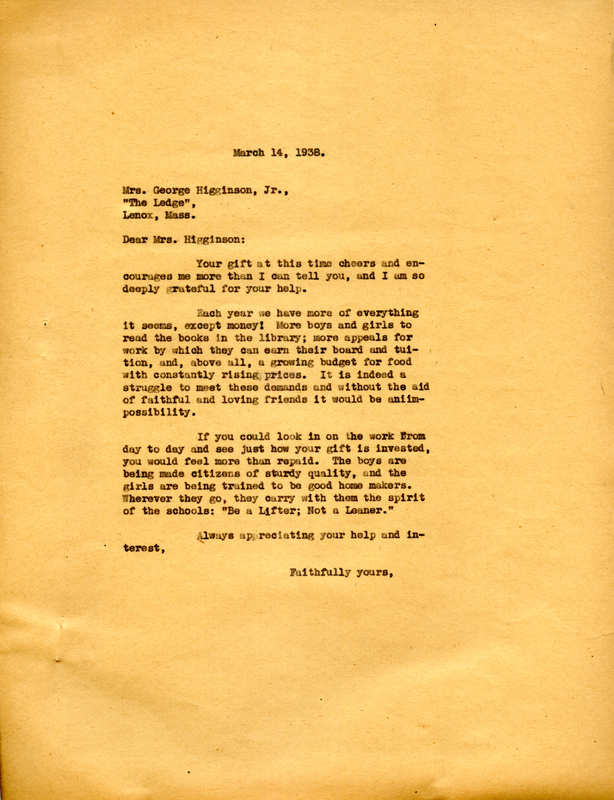 Martha Berry, “Letter to Mrs. George Higginson, Jr. from Martha Berry.” Martha Berry Digital Archive. Eds. Schlitz, Stephanie A., Olivia Mund, Cassie LaJeunesse, Jessica Hornbuckle, et al. Mount Berry: Berry College, 2016. accessed April 19, 2019, https://mbda.berry.edu/items/show/14502.